In some cases, the trajectory of an elastic beam propagating within a phononic crystal featuring a transverse gradient of its elastic properties can be rigorously calculated. However, when comparing the theoretical results to experimental data or to finite elements computations, the acoustical displacement on the surface of the system is generally found to be significantly larger than expected. The reason frequently given to explain this discrepancy is that, in the actual system, the elastic properties do not vary continuously along the gradient direction, in contrast to the assumptions made to calculate the trajectory. By considering the acoustical wave vector and the group velocity as local parameters, members of the team “acoustics for nanosciences” at INSP have shown that the real explanation lies much more in the shape of the equifrequency contours, which in some part of the acoustic lens may significantly depart from being circular, inducing therefore an unwanted anisotropy in the elastic properties. The achievements of any imaging system, either optical or acoustical, can be estimated through the resolving power, i.e. its ability to deliver a sharper image of two points very close to each other. In any conventional device, this property is limited, among other factors, by the diffraction limit or by the spherical aberrations. Since a few years, several teams in the world have shown that the diffraction limit may be overcome by using phononic crystal-based acoustic lenses. On the other hand, one can easily show that a 2D plane lens which index varies along one direction according to a hyperbolic secant law, is free from spherical aberrations. Unsurprisingly, it comes to the mind of the one who wants to achieve a focus as sharp as possible, to combine both these characteristics and to design 2D acoustical lenses based onto phononic crystals featuring an acoustic index with a hyperbolic secant profile. The gradient index acoustic lenses we have considered for this study are made of silicon membranes with air holes drilled throughout. 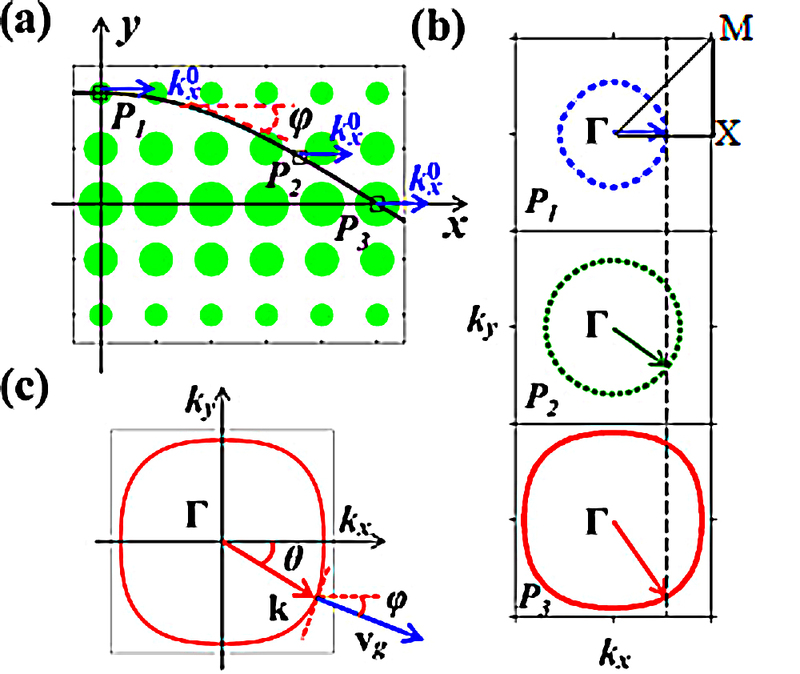 The gradient is achieved, either through the modulation along y-direction of the holes diameter, while keeping constant the distance separating two adjacent holes (squared symmetry – case depicted in figure 1-a), or by keeping constant the diameter of the holes and modulating the distance between them (rectangular symmetry). The geometrical parameters are calculated for the acoustical index (ratio of the sound velocity in the lens to the sound velocity in the membrane) to follow a hyperbolic secant profile. (a)	Trajectory of an elastic wave within a 2D phononic crystal-based gradient index lens. (b)	Equifrequency contours, calculated in three points along the trajectory. The component along x-axis keeps a constant value all along the trajectory. (c)	Case of a non-circular equifrequency contour (point P3). The group velocity vg is normal to the equifrequency contour but not collinear to the wave vector k.
The dispersive properties of an elastic wave propagating in such a heterostructure vary along y-axis and therefore, the dispersion curves must be computed for each line of air inclusions such as the ones drawn in figure 1a. The filling ratio in the lines of inclusions close to the edges are small and at low frequency the modulus of the wave vector is constant, whatever the direction of propagation is (points P1 and P2 in figure 1-b). It is a totally different situation nearby the central axis of the lens, where the diameters of the inclusions are close to the lateral dimensions of the unit cell. In that case, the equifrequency contours are not circular anymore (points P3 in figure 1-b and figure 1-c) and the group velocity is not collinear to the wave vector in turn, except along the main axes of the equifrequency contour. the modulus of the wave vector along ΓM (resp. ΓX) in the first Brillouin zone. This expression well accounts for the local anisotropy and allows calculating the trajectories within a lens with a squared symmetry. We have obtained a similar expression for lenses with a rectangular symmetry. We have measured the out-of-plane component of the zero order antisymmetric Lamb wave propagating in a gradient index lens with a squared symmetry. The model very well explains the experimental results (figure 2). The agreement is equally good if the symmetry is rectangular. Our model allows to very accurately determine both the focal distance and the lateral dimensions at the focus, in gradient index phononic crystal. It facilitates therefore the engineering of this family of acoustic lenses and allows to easily determine the geometrical parameters that optimize the focalization of guided elastic waves. 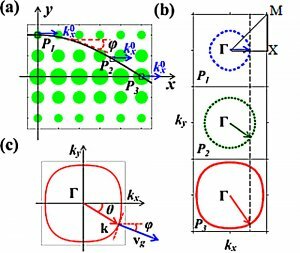 This work is part of a larger study aiming at elaborating acoustical metamaterials with local resonances. The lenses we have described here will be used to excite specific zone of the heterostructure. Measured normal displacements associated to a Lamb wave confined in between the free surfaces of a gradient index acoustical lens. The dashed lines are for the trajectories deduced from the model.